Life begins with a surge of calcium ions (Ca2+) at fertilization, and thereafter, Ca2+ signaling influences nearly every aspect of mammalian development and physiology, from gene expression and cell proliferation to muscle contraction and nerve impulses. To create spatiotemporally distinct Ca2+ signals, cells use a variety of mechanisms to recognize, transport, and buffer Ca2+. Thus, a diverse range of reliable experimental techniques is necessary to study the movement of Ca2+ and the various effectors involved. This laboratory manual provides step-by-step protocols for studying many facets of Ca2+ signaling, as well as background information on the principles and applications of the techniques. Contributors discuss how to use fluorescent, luminescent, and genetically encoded Ca2+ probes in conjunction with state-of-the-art imaging modalities to characterize Ca2+ signals. Electrophysiological measurements of Ca2+ channel activity are described, as are radioactive Ca2+ flux assays and methods to investigate signaling mediated by specific Ca2+-mobilizing messengers (IP3, cADPR, and NAADP). Techniques to modulate and suppress intra- and intercellular signals are also provided. Each protocol is complete with a list of required materials, detailed recipes for media and reagents, and troubleshooting advice. Specific chapters are devoted to Ca2+ signaling techniques in nonmammalian systems, such as plants, yeast, zebrafish, and Xenopus. Methods for assessing Ca2+-binding kinetics and strategies for developing mathematical models of Ca2+ signaling are also included. 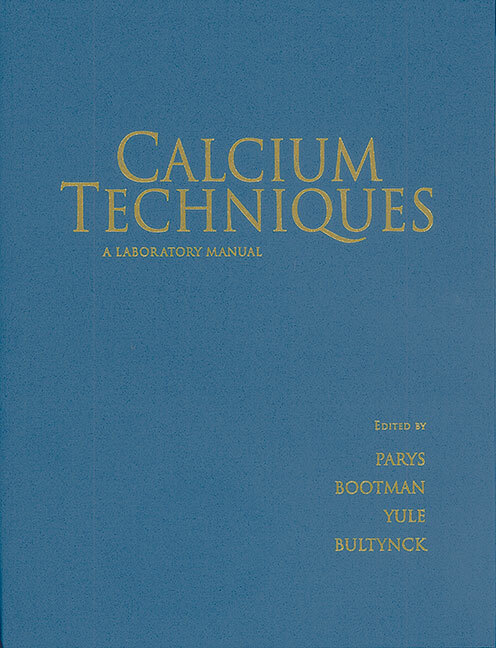 Thus, this manual is a comprehensive laboratory resource for biochemists, cell and developmental biologists, and physiologists who are using or looking to expand their repertoire of Ca2+ techniques.